They’ve stood sentinel over the practice putting greens at Pinehurst for decades. They’ve traveled the world on the shirts and caps of golfers. 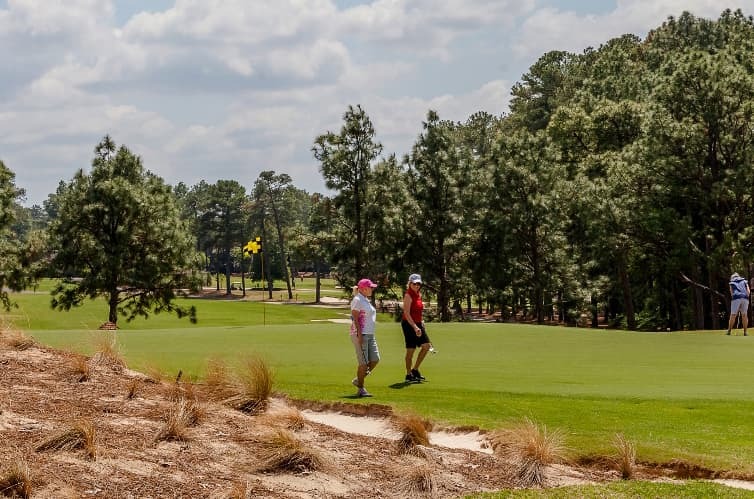 They’ve lured guests to Pinehurst from the pages of newspapers and magazines for a century. And they’ve been the centerpieces of handsome marks for Pinehurst’s chapters in the U.S. Open. “The Golf Lad” and his offspring pal, “The Putter Boy,” are certainly among the most famous inanimate figures in the game of golf. Frank Presbrey, Pinehurst’s first advertising counselor, in the early 1900s created a young boy that appeared in the resort’s early advertising and calendars who was called “The Golf Lad,” “The Golf Boy,” or “The Golf Calendar Lad.” Later he was replaced on the calendars sent annually to hotel guests by photos of Donald Ross playing the Pinehurst golf courses. Phil Mickelson putts near Pinehurst’s iconic Putter Boy statue on Friday of the 2014 U.S. Open. In 1912, sculptress Lucy Richards used the lad as the model for her bronze statuette in sundial form. Since Richards wasn’t a golfer, Ross demonstrated the proper grip and stance for her—but the image is not of Ross, who was a grown man at the time. The shaft of the club created the shadow that would be used on the sundial to tell time, and in order to get the proper angle, the length of the club had to be inordinately long. The statue was known as “The Sundial Boy” until the 1970s, when “The Putter Boy” name caught on. For many years the statue sat on a concrete base between the two large putting greens beside the clubhouse. It was moved in 1978 to the PGA/World Golf Hall of Fame but returned to Pinehurst around 1990 and now is displayed prominently once again outside the clubhouse. When Pinehurst’s marketing and retailing officials were trying to decide what components to use for the logo for the 1999 Open, Stephen Cryan believed “The Golf Lad” was a natural choice. Cryan, then the director of retail operations at Pinehurst, felt the image from old advertisements was classic and respected and an ideal graphic to associate with the Open at Pinehurst. The 1999 logo was immensely successful and the “Lad” was naturally recruited as the focal point for the 2005 Open mark—but with a few changes. A 1909 ad depicting the “Lad” swinging a golf club with the words “Back to Pinehurst” was a natural progression. The shape was changed from oval to circular and vestiges of the American flag were worked into the background. That proved a prophetic move in early 2001 before the outbreak of patriotism following the 9-11 terrorist attacks on New York. The “Lad” has also been the subject of a series of five posters created by artist Eric Johnson that show him in various poses around the Pinehurst campus. Three more scenes have been painted as well and together the eight images will be used on tickets for the 2005 Open. One of the most popular posters shows the “Lad” leaning against a column outside the clubhouse, looking wistfully at the riches of golf landscape around him. Another captures the “Lad” sinking a putt on the 18th hole of No. 2. He’s extending one arm in front of him and one leg behind him—a la Payne Stewart in the statue in the background. Cryan looks out and sees a lad no more than 10 years of age is stroking putts, and each time he makes a putt, he celebrates with a Stewart-esque thrusting of his fist and leg.